A postcard shows the Tygart River winding through Grafton and the steep hills of the cup-shaped valley in which it is nestled. 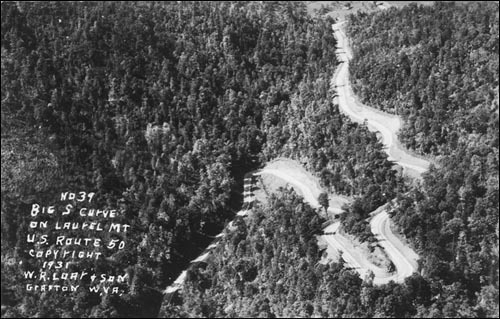 An aerial photo from 1931 shows an S-curve on U.S. Route 50 at Laurel Mountain. 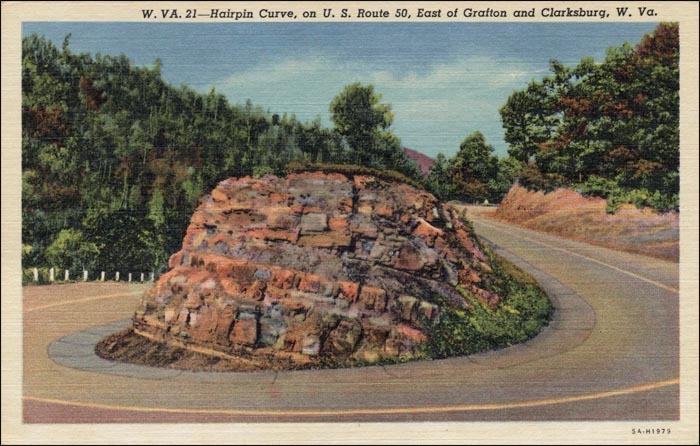 And another postcard gives an indication of the Grafton mountainous terrain, also on U.S. Route 50 east of Grafton. 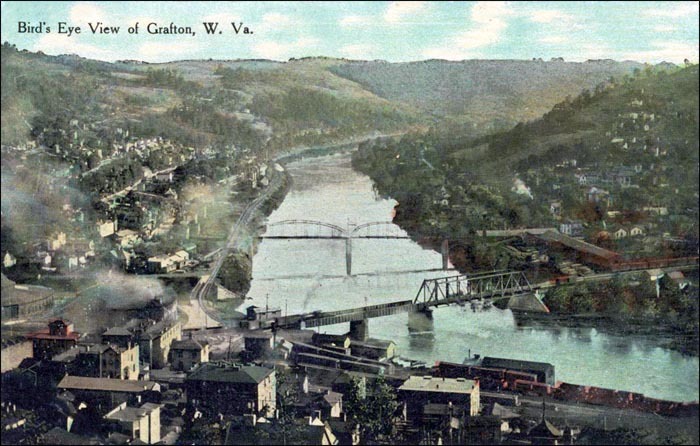 Surrounded by grazing country and scattered coal mines, Grafton is built on the steep hills of a cup-shaped valley located on the Tygart River, as shown by the postcard at right. In 1773, by preemption, William Robinson acquired approximately 400 acres in the area that is now Grafton, but he never farmed or developed it. 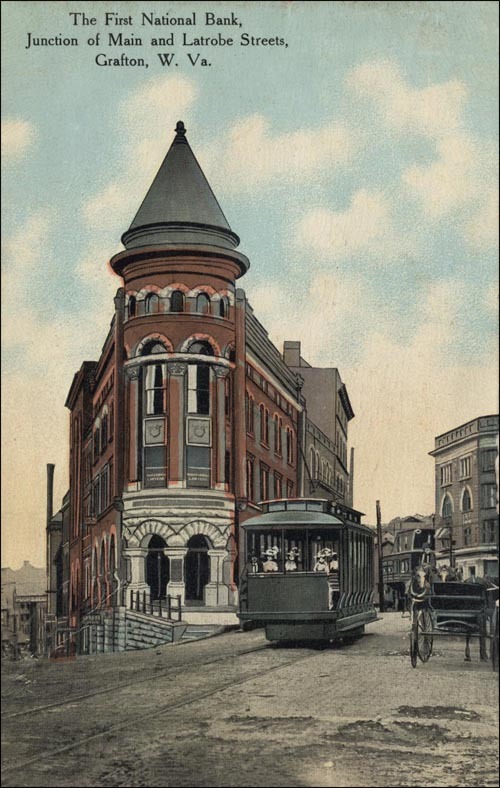 When the Irish construction crews for the Baltimore & Ohio Railroad arrived in 1852, "the entire countryside was still a tangle of grapevines and wild berry briars," according to "West Virginia, A Guide to the Mountain State." Because Grafton was the end of the rail line for four divisions of the B&O, when the railroad was completed a community sprang to life there. The town was incorporated in 1856; stories differ as to how Grafton got its name. Some historians think that it was named for John Grafton, who worked for the B&O as a civil engineer during the railroad's construction. Others think that it received its name from the railroad construction crews. Not that it makes this version any more true, but in his remarks at Grafton on Oct. 16, 1948, as part of his "Rear Platform" visit to West Virginia, President Harry Truman said, "I have always liked the story I read once about how Grafton got its name. As I remember it, it seems that the railroad construction crews that came in here about 100 years ago called this place on the railroad the 'grafting on' point because so many branch lines were hooked onto the main line here." Because of its rail yards and shops, Grafton was of strategic importance during the Civil War, and over time was occupied by both Union and Confederate troops. Both sides realized the urgency to control the region, and as a result Grafton and the Taylor County area became a launching site for what is recognized as the first organized land battle of the Civil War, which took place at Philippi. 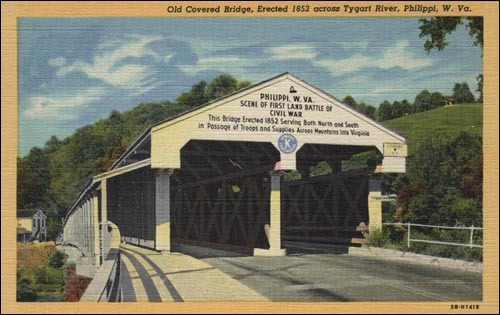 Click here to see the Centennial Plate of the Philippi Covered Bridge; a postcard of the bridge is below, right. 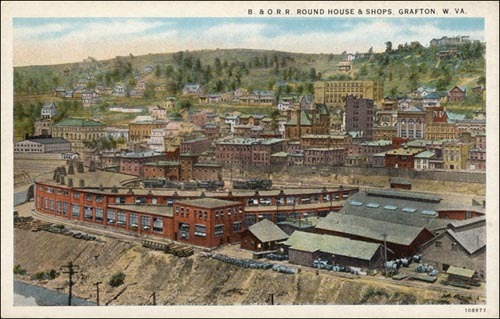 This postcard shows the B&O Roundhouse that was built between the town of Grafton and the Tygart River. The first land battle of the Civil War took place at Philippi, which is south of Grafton. The cemetery contains the remains of Thornsberry Bailey Brown, who is believed to be the first Union casualty of the Civil War when he was killed by a Confederate sentry on May 21, 1861. After the war, which resulted in the creation of West Virginia as a Union state when it seceded from the rest of Virginia in 1863, the City of Grafton continued to grow, spurred on by the railroad, timber and manufacturing industries. In 1867, Major R. C. Bates, under the direction of the U.S. War Department, selected a small, three-acre site adjacent to the Maple Avenue Cemetery in Grafton as a National Cemetery for the Union casualties throughout West Virginia. In 1868, West Virginia's first governor, Arthur I. Boreman, dedicated the cemetery, which he had been instrumental in getting located in the state. 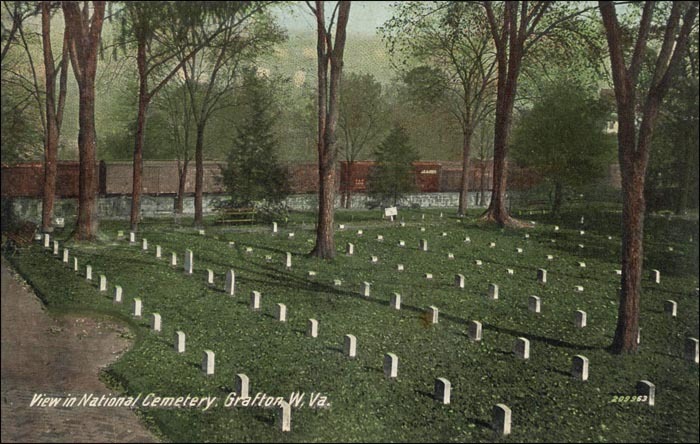 Although some Confederate soldiers were eventually buried at the Grafton National Cemetery, the vast majority of graves hold Union soldiers and the cemetery is now closed for new interments. After the war, as the B&O extended branch lines into the surrounding regions to transport timber and coal, Grafton became the trade and transportation center for nearby coal and lumber towns. Around 1870, a large sawmill was constructed in the area to cut logs, which were floated down the Tygart River to be processed into lumber. According to "West Virginia, a Guide to the Mountain State, "In 1872 Grafton aspired to become the State's capital. Delegates from near-by counties, presided over by Joseph Johnson, convened here and drafted resolutions instructing their delegates to the Constitutional Convention at Charleston to seek the removal of the capital from Charleston. Although it failed in this, [Grafton] succeeded in becoming the county seat in 1878." The U.S. Census of 1880 showed that the population of Grafton was 3,030 and that Taylor County as a whole was 11,453. Twenty years later, in 1900, the City of Grafton had almost 12,000 residents; it continued to grow, but at a slower pace, until the 1920's. 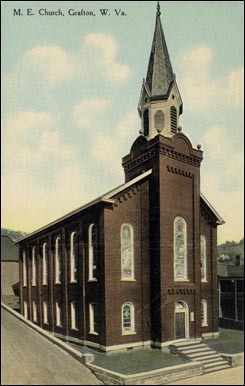 Above left, on May 15, 1962, the historic Andrews Church, built in 1873, became the International Mother's Day Shrine and in 1967 the congregation vacated the building to a new church building location. 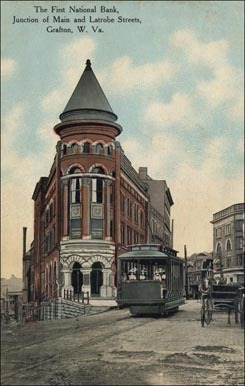 Above right, a postcard show the First National Bank of Grafton. In 1911, the B&O Railroad opened an impressive new station that served Grafton until the mid-1970s. It is shown above, next to the Willard Hotel, which is also closed. 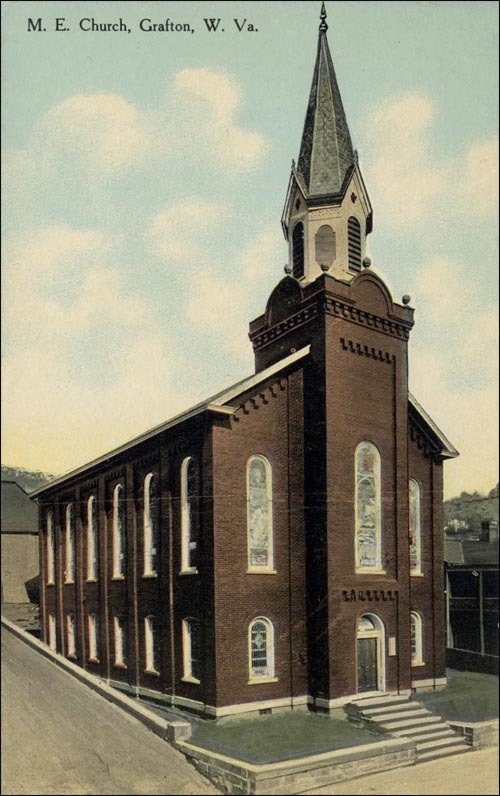 In 1908, Miss Anna Jarvis requested that a service be held at the Andrews Methodist Church in Grafton to honor her Mother, Anna Reeves Jarvis, and other mothers throughout the world. This first Mother's Day service was held on May 10 of that year, and in 1914 Congress authorized the president to designate the second Sunday of each May as Mother's Day. Click here to see a Mother's Day plate. Before the construction of interstate highways, getting to Grafton by automobile or truck was a challenge. The main highways into Grafton, U.S. 50 and U.S. 119, were famous for their hairpin turns and mountainous terrain with some of the deepest highway cuts in the country. As noted earlier, the B&O Railroad played a major role in the City of Grafton's growth and provided employment for generations of families. In August 1911, the railroad dedicated an impressive new station that served the city until the mid 1970s. The B&O Station was built adjacent to the six-story Willard Hotel that was named for Daniel Willard, president of the B&O Railroad at the time of its construction. 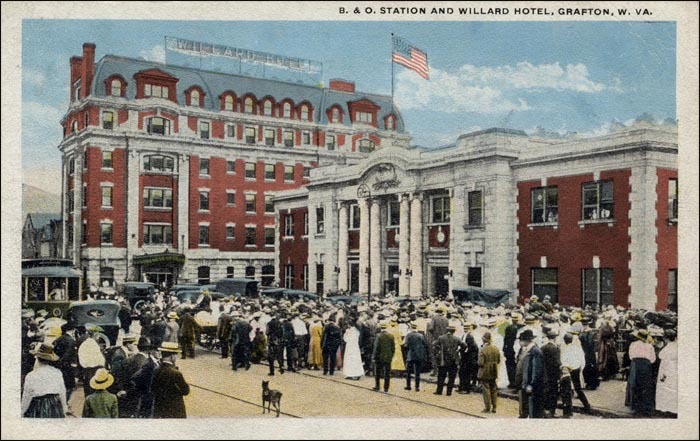 When it opened, The Willard was considered to be one of West Virginia's most elegant hotels, and the station matched its elegance with its marbled columns in the passenger lobby. Most of current day Grafton was built between 1890 and 1930, and the city continued to prosper through the first half of the 20th century. However, in 1952 when the Carr China Company shut down it left hundreds of residents without jobs, as did the Hazel-Atlas Glass plant when it closed later in the decade. In 1958, the women of Grafton organized a parade through downtown Grafton as part of "Operation Survival" and carried a banner proclaiming that 1,500 jobs were needed. Their efforts received national attention and helped Grafton encourage a manufacturer of plastic baby toys to move to the area. Grafton was named an All-American City in 1962. However, in the early 1980s the railroad relocated hundreds of jobs to Jacksonville, Fla., and as a result the city received yet another major economic setback. The population has dropped to slightly less than 5,000. Although Grafton has certainly seen better days, it seems to be turning the corner and is now headed in a more positive direction. New businesses are beginning to open along Main Street, and Grafton is experiencing new residential and commercial development for the first time in many decades. West Virginia National Cemetery website, the historical information section.